If you're looking for book marketing & selling tips for authors, then Author Marketing Club is a great place to start. This website has been around for a while now, so many writers will already know of it. But hopefully I will reach some of you that are new to the site. (For those enrolled in Amazon's KDP program) - AMC have made an excellent page on their site where the top websites to submit your KDP free days to are all brought together in one place - AND each link takes you directly to the submit form, so you don't have to waste ages searching through the websites yourself. When you sign up as member, you gain access to an extremely helpful forum where other authors are willing to give feedback on your work and share tips and tricks on advertising. For example: reviewing your book cover image, sharing book trailers, or even reading and reviewing your novel(s)! 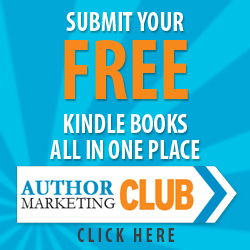 Author Marketing Club has a variety of marketing options for authors. Some are free, others are paid. But even the paid ones start from as low of $1. If you're wanting exposure for your book, then it's worth taking a look at what they have to offer. I love coming across websites like AMC, where they are so passionate about promotion. And a great thing about them is that they don't try to keep you from leaving their website; they actually send you off to other brilliant sites for authors. So, for Book Marketing & Selling Tips for Authors, click here!